 Analysis of "Bazille's Studio"
Frederic Bazille studied at Charles Gleyre's studio in Paris alongside other Impressionists including Alfred Sisley (1839-99), Claude Monet (1840-1926) and Auguste Renoir (1841-1919), and explored the studio's speciality style of plein air painting, although his most famous works were created indoors. His death in the Franco-Prussian War at the age of only twenty-nine cut short his career as a painter and caused him to be totally overshadowed by the other Impressionists. Even so, his paintings as well as the financial support he gave Monet and the others (he came from a wealthy family) made an important contribution to the success of the movement. To begin with Bazille shared a studio (formerly used by Delacroix) with Monet at 6 rue Furstenberg. Monet's difficult character and his incessant requests for money did not exhaust the sympathy of Bazille who came to his aid on several occasions. Having also taken in Renoir, he then went to live by himself in a new studio in the Rue Godot-de-Mauroy; then in the Rue Visconti; finally, in 1868, he went to live in the Batignolles where the proximity of the Cafe Guerbois gave him the opportunity to meet Henri Fantin-Latour (1836-1904), and sometimes even Paul Cezanne (1839-1906). NOTE: For the full story behind French Impressionism and the avant-garde group of painters who created it, see our 10-part series, beginning: Impressionism: Origins, Influences. 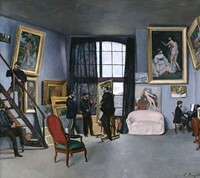 The scene in the painting takes place in Bazille's studio at 9 rue de la Condamine (formerly Rue de la Paix), which he shared with Renoir from January 1868 to May 1870. As he said in a letter home, "I have amused myself hitherto by painting the interior of my studio with my friends. Manet is painting me". The painting depicts the artist with three Impressionist painters and two other friends. They include (from left to right): Auguste Renoir (seated); the writer Emile Zola (on the stairs); probably Claude Monet (smoking); Edouard Manet (with hat and stick); the tall silhouette of Bazille himself (obscuring the picture on the easel) was added by Manet. On the right, the pianist and art collector Edmond Maitre (1840-98), Bazille's closest friend, is sitting at the piano. On the wall above him hangs a still life painting purchased by Bazille from Monet - a symbol perhaps of the financial assistance offered by Bazille to his fellow artists. Also visible are some of Bazille's pictures that were refused by the Salon, including The Toilette (1869-70, Musee Fabre, Montpellier) (unframed above the sofa), and Fisherman with a Net (Rau Foundation, Zurich) (high up on the left), as well as Renoir's Landscape with Two People (1865) (the large, framed painting to the right of the window), which was rejected at the 1866 Salon. See also Bazille's famous portrait Family Reunion (1867). As usual, his work shows a distinct freshness, precise attention to detail and realistic facial expression. The pink sofa, along with red chestnut wood of the chair and framed pictures, all manage to enliven the grey tones of this large room, which is lighted by a tall window. This picture remained in the possession of the artist's family till 1925, when it was given to the Luxembourg by Messieurs Frederic and Andre Bazille, and Monsieur and Madame Salinelles, the painter's nephew and niece; it went to the Louvre in 1931, and to the Musee d'Orsay in 1986. NOTE: Compare Courbet's earlier work The Artist's Studio (1855).  The Cradle (1873) by Berthe Morisot.  For analysis of other Impressionist paintings, see: Homepage.